It turns out concerns over driving costs don’t go away with the purchase of a fuel-efficient vehicle. 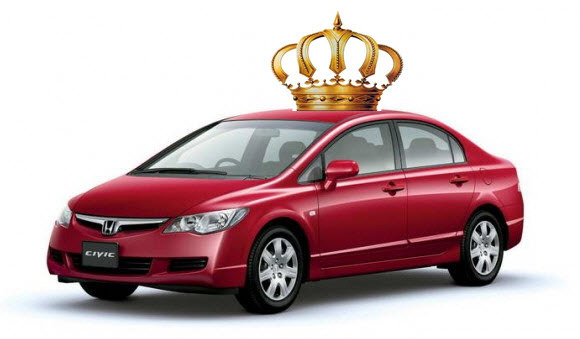 After pouring over data from a million vehicles that have been entered on our popular trip calculator we’re ready to announce that the Honda Civic, one of the most fuel-efficient vehicles on the market, takes the crown as the most frequently entered vehicle on Cost2Drive.com. 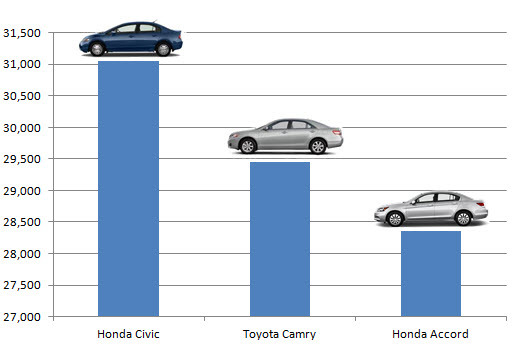 Over 31,000 Honda Civic owners have turned to Cost2Drive to help plan car trips, narrowly edging out Toyota Camry and Honda Accord owners for the top spot. When we launched Cost2Drive we thought the site would attract owners of larger, less fuel-efficient vehicles like SUVs and pickups, so we were a little surprised to find such fuel-efficient vehicles dominating the top of the list. It appears that concerns over driving costs remain even after the purchase of a fuel-efficient vehicle, perhaps because gas prices remain at historic highs. In a previous post we revealed that Ford ranked as the top car brand on Cost2Drive with Ford owners entering over 125,000 vehicles in our Galculator, and yet no Ford vehicles landed in the top three positions. However Ford is well represented with four vehicles in the top ten list including the Ford Explorer which is the top-ranked SUV, and the F150, the top pickup truck. We were curious to see how this list compares with the overall distribution of all vehicles on the road today in the US so we posted a question on popular Q&A site Quora seeking that information. An Edmunds analyst was kind enough to provide us with the overall breakdown. 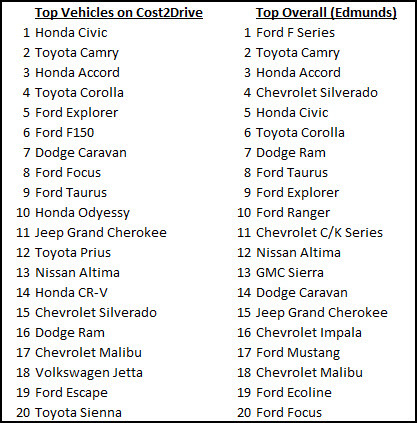 One noticeable discrepancy between these two lists is that SUVs and minivans rank higher on Cost2Drive whereas pickup trucks rank higher on the list of all vehicles on the road. This could be because Cost2Drive attracts more of a leisure travel audience such as families that are planning vacations. 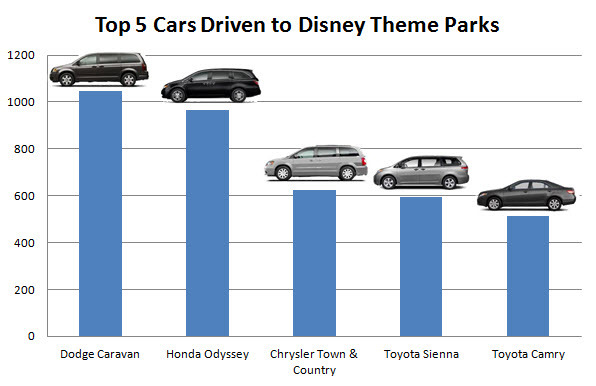 Evidence of this can be found in the high volume of routes to Disney theme parks entered on Cost2Drive in 2011, where the leading vehicles are minivans. The average age of the million vehicles that have been entered on Cost2Drive.com is 7.3 years, meaning our audience is driving cars that are 2.7 years younger than the 10-year average age of all vehicles on the road today in the US. As a final bit of analysis we decided to take a look at the average age of the top ten vehicles to see how it compared with all vehicles. The average age of the top ten vehicles is 7.6 years, slightly older than all vehicles entered on Cost2Drive.com. The Ford Focus came in as the youngest vehicle entered with an average age of 5.1 years and the Ford Explorer was the oldest at 9.2 years. 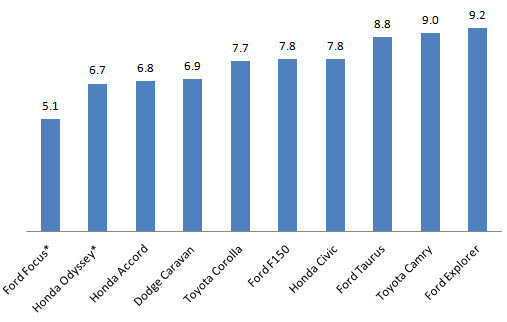 *Important to note is that the analysis covers vehicles going back to the 1990 model year, and that results for the two youngest vehicles are skewed due to later vehicle launches (Ford introduced the Focus in the US market in 1999 and Honda launched the Odyssey in 1995). This post is the final installment of a 3 Part Series where we revealed data on a million vehicles entered on Cost2Drive.com to coincide with the North American International Auto Show. 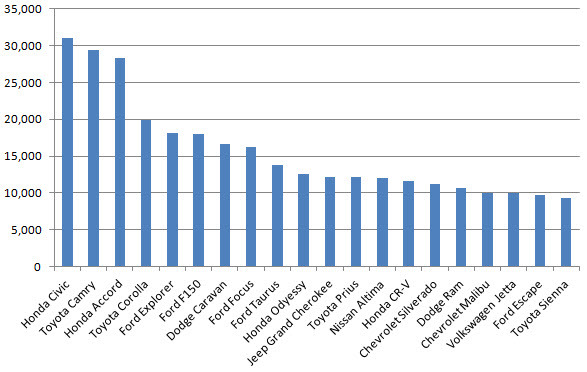 The two previous posts looked into the top luxury vehicles entered on Cost2Drive and the top car brands overall. If you have any questions regarding the above information or C2G, LLC feel free to send us a note here or email me directly at jim@costtogo.com.